Outcomes generally improved with some important caveats. Total graduates declined nearly 10% year over year, from 4403 in the Class of 2015 to 4081 in the Class of 2016. That resulted in marginal improvements in employment outcomes: 64.3% in unfunded full-time, long-term, bar passage-required and J.D.-advantage positions, up from 63.8%. 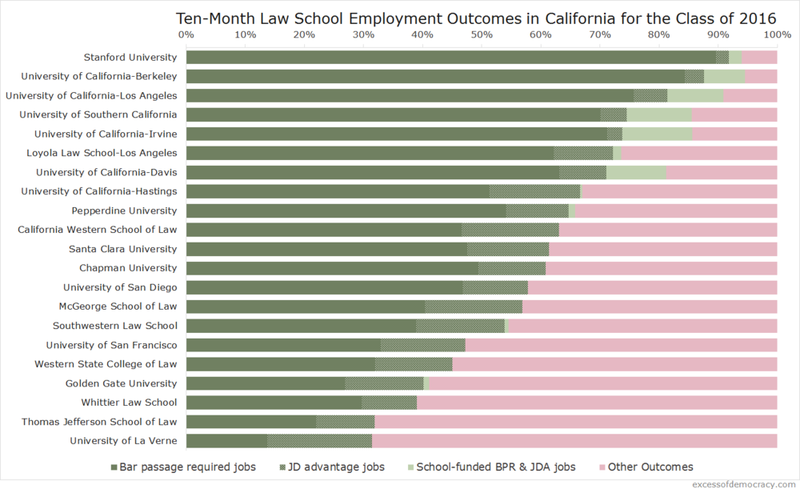 But total jobs in these positions declined, from 2807 to 2624, likely attributable in part to challenging bar passage rates (and perhaps because of conditions relating to California's job market).